Osteoporosis is a skeletal disorder characterized by compromised bone strength predisposing a person to an increased risk of fracture and is one of the most common conditions associated with ageing (Pietschmann et al. 2009). It is also a condition of significance in severe asthma. Corticosteroids are commonly used to treat airway inflammation in people with asthma, however steroid exposure is associated with a number of side effects. One of the most debilitating of these is osteoporosis. A consequence of osteoporosis is bone fractures, and these have a significant impact on a person’s quality of life as well as societal impacts. Fractures due to osteoporosis can result in chronic pain and well as long-term disability and death. As such recognizing risks in people with severe asthma, taking steps to prevent osteoporosis, and treating those at risk or already diagnosed is important. A number of behaviours and traits can increase the risk of osteoporosis. Some of these are particularly relevant for people with severe asthma, such as oral corticosteroid use, female gender, smoking, physical inactivity and sedentary behaviour. Due to the higher rate of systemic corticosteroid treatment that is required for people with severe asthma, the burden of corticosteroid-induced osteoporosis may be particularly great in this population. People with severe asthma are reported to have a 5 times greater odds for developing osteoporosis and osteopenia compared to people with mild/moderate asthma, and almost 7 times greater odds than people without asthma (Sweeney et al. 2016, Li et al. 2015). The International ERS/ATS Guidelines on Definition, Evaluation, and Treatment of Severe Asthma (2014) recommend that prophylactic measures should be taken to prevent bone density loss in children with severe asthma who are being treated with continuous systemic corticosteroids (Chung et al. 2014). While there is limited research assessing the impact of interventions, recommendations for osteoporosis screening and treatment in patients receiving chronic glucocorticoid treatment have been published in the UK, Europe, Canada, Japan, and the U.S. (Adachi et al. , 2000, Lekamwasam et al. 2012a, Lekamwasam et al. 2012b, Suzuki et al. 2014, Buckley et al. 2017). Clinical guidelines on prevention and treatment of osteoporosis in postmenopausal women and older men published by The Royal Australian College of General Practitioners (RACGP 2010) recommend that patients receiving glucocorticoid treatment for >3 months with ≥7.5 mg/day undergo assessment of absolute fracture risk via the Fracture Risk Assessment Tool (FRAX) (Kanis et al. 2008) or the Garvan osteoporosis fracture risk calculator. For more information see Resources – Risk Factor Components. Anti-osteoporosis treatment is recommended for those patients with high 10-year risk of fracture. This guidance can be applied in patients with severe asthma. A diagnosis of osteoporosis is made following an assessment of bone mineral density. Bone mineral density is measured using Dual Energy X-Ray absorptiometry (DEXA). 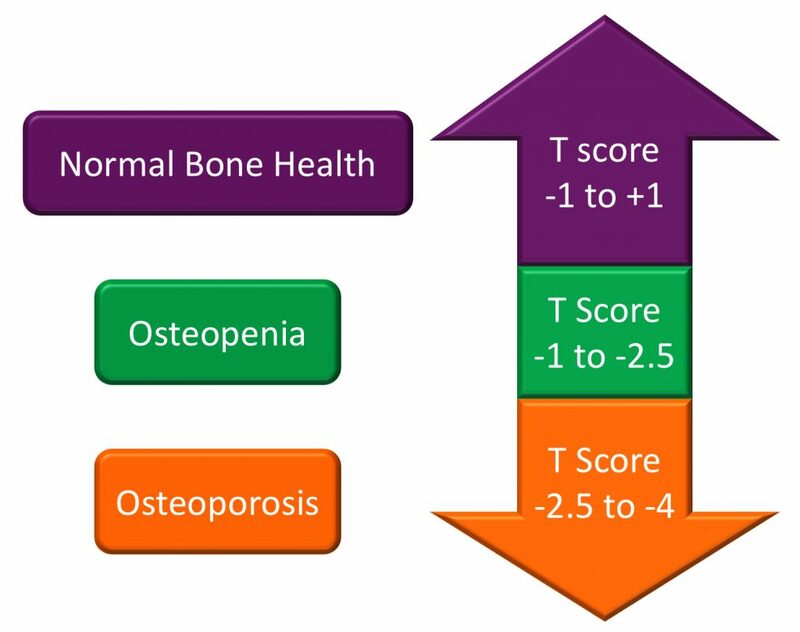 Cut points from normal bone health, osteopenia and osteoporosis are shown below (RACGP 2010). 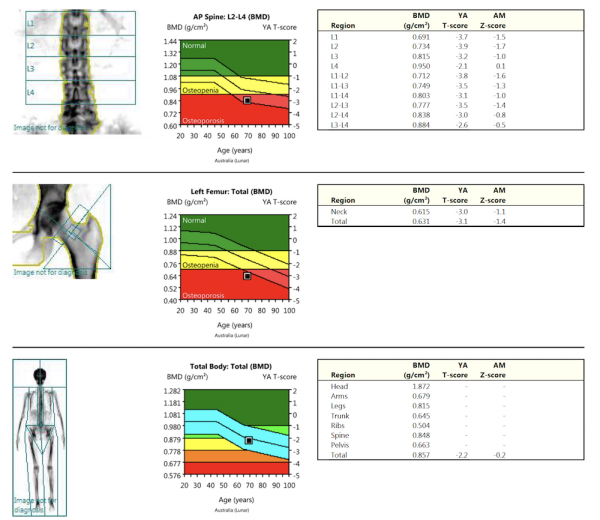 An example DEXA scan report, indicating osteoporosis in the spine and femur.